The Conservatives have held on to the eastern Ontario riding of Leeds-Grenville-Thousand Islands and Rideau Lakes in Monday night's federal byelection. The Conservatives held on to the eastern Ontario riding of Leeds-Grenville-Thousand Islands and Rideau Lakes in Monday night's federal byelection. 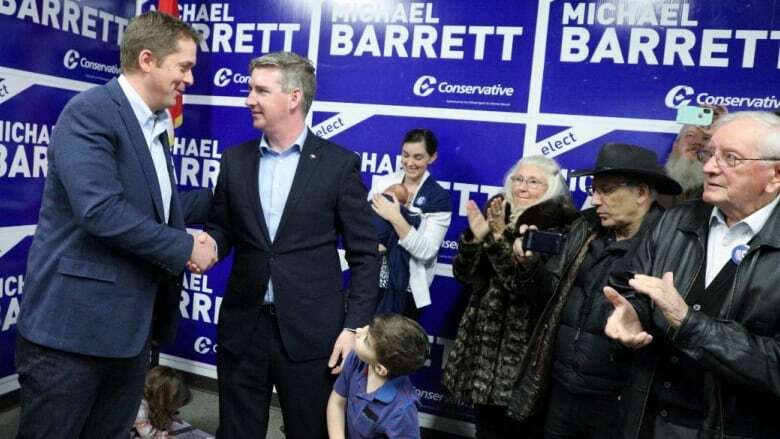 With all 238 polls reporting and more than 29,000 votes counted, Conservative candidate Michael Barrett was ahead with 57.8 per cent of the vote by the night's end, according to Elections Canada's preliminary results. The Liberals were looking for signs of growth in tonight's federal byelection as they attempted to reclaim a seat that has not been held by a Liberal since before the 2004 federal elections. There were five candidates vying for office, including Barrett, Liberal Mary Jean McFall, New Democrat Michelle Taylor and Lorraine Rekmans​ for the Green Party — Independent candidate John Turmel was also running in the contest. Conservative Gord Brown held the riding between 2004 — when he snatched it away from the Liberals, who had held the riding since 1988 — and his death earlier this year. Barrett was elected councillor for the village of Spencerville and surrounding area in the municipality of Edwardsburgh/Cardinal in 2014. He said the Liberals broke their promises to deliver infrastructure investment and a balanced budget in 2019, and pledged that a Conservative government would "bring real investment back to Leeds-Grenville-Thousand Islands and Rideau Lakes." McFall is the former chief of staff to Agriculture Minister Lawrence MacAulay. She ran for the Liberals in the riding in the 2015 general election, narrowly losing with 41 per cent of the vote to Brown's 47 per cent.​ McFall said she would have sought to bolster federal investments in her riding and stand up for local farmers and producers if she had won. Taylor for the NDP promised she would be an accountable representative standing up for veterans, farmers and small business owners. The Green Party candidate, Lorraine Rekmans, has been the party's indigenous affairs critic since 2008. She told CBC that while the biggest issue facing her riding is climate change, she'd also pursue affordable housing, poverty relief and health care issues if she is elected. Jim Jordan captured it for the Liberals in 1988 and held it for nine years. His son, Joe Jordan, was able to win the riding twice more for the Liberals, but only because the conservative vote was split between Progressive Conservatives and the Canadian Alliance. Since the reuniting of conservative forces in 2004, the Conservatives have been pretty much invincible in the riding. His fifth and last election, in 2015, was his closest brush with defeat.